Small house extensions make a great alternative if you lack the space or budget to add a large extension to your home. A modest, but well-designed addition can be transformative, changing the aspect of a room, bringing in valuable extra daylight, linking existing spaces or improving circulation and flow. Whether you're adding a porch or a modest loft extension, a small single storey extension or a side return extension, you can add both value and space to your home if you get it right. These small extension ideas will get you started. Find much more advice on extending a house in our ultimate guide. How much do small house extensions cost? You can expect to pay from £900 to £3,000 per m² depending on location, specification and scale. For a good idea of the cost of your small extension, check out our extension cost calculator. It's worth noting that smaller single storey extensions tend to be proportionally more expensive than double storey extensions because of fixed costs such as planning and design, building regulations fees and the fact that there are no economies of scale. This said, they are a worthy investment if their addition will transform the feel of your space. Whether you want to maximise loft space with a loft conversion or add more living space downstairs with a basement conversion, we've got all the advice you need. Or perhaps you want to up the square feet at the front of your house by adding a porch or bring more light into your home and connect to the garden by building an orangery, the options are abundant. Adding an enclosed porch can act as a useful buffer to the elements, especially if your front door opens directly into a living room or you'd like to make a small hallway feel more spacious. If you've inherited a loft conversion from a former owner and are dissatisfied with the amount of full-height space, a box dormer is an easy solution that promises to transform the feel of your loft. It can be especially useful in providing the headroom needed to add stairs into a loft (1.9m minimum at centre) or for a loft bathroom. Extensions that add only a metre or two in width can’t usefully form a living room in their own right, so it is often best to use the space to extend an existing room, linking old and new with as wide an opening as possible. The exception is if the space is used as a cloakroom or utility room. A covered walkway linking a house to an outbuilding, such as a garage conversion, can be very successful. A glazed walkway can be a great solution to planning restrictions – for example, a listed building, where a solid link would be inappropriate. Adding a small glazed extension to the back of a basement conversion will flood the space with light, helping it appear larger and lighter. The extension needs only to be modest in scale and works well if it opens onto a sunken courtyard, with stairs up to the garden. A projecting bay window extension can enlarge a room and does not necessarily require foundations – it can be cantilevered on brackets from the existing structure. Windows on three sides also bring in extra light, enhancing the spacious feel of a room. Many terraced and semi-detached homes have a small outdoor area behind and at the side, called the side return. 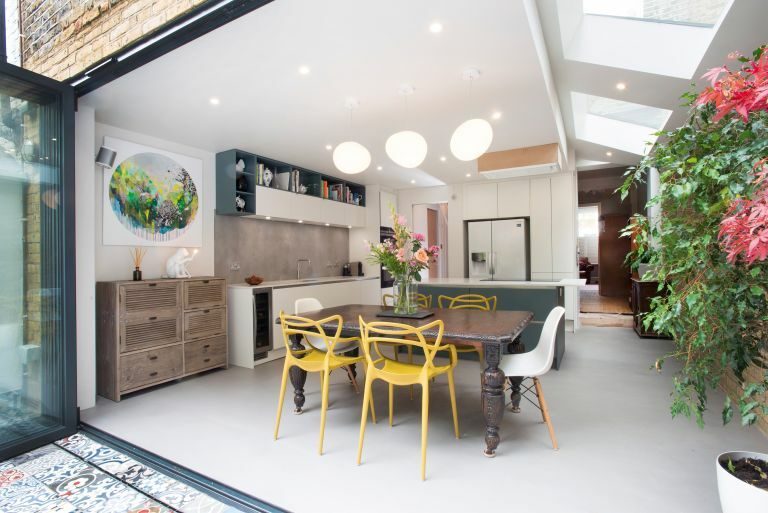 Filling the space with a single-storey extension is a great way to increase the size of a kitchen, making it better suited to become an open plan kitchen living and dining room. Find out more about adding a side return extension, and take a look at our gallery of Victorian terrace extensions for inspiration. An addition that can be built (subject to size and design) without planning permission or building regulations consent, building a conservatory is a great way to create an additional living room. To use it all year round, you will need to invest in heating and conservatory blinds. Find out more about building a conservatory in our guide. Use our guides to planning permission and building regulations for more information about any other extension type you'd like to build. Adding an orangery is the perfect balance between building an extension and conservatory. With areas of solid walls and solid roof with a glazed roof lantern, it is better insulated than a conservatory and is easier to control the temperature. See our guide for lots more information. There are many modular extension systems that offer a design-and-build solution for a new room. An oak frame extension is a more traditional option – a single room with a pitched roof featuring a vaulted ceiling with exposed trusses. Whether you're planning to build a single storey extension into a side return or across the back of your house, adding in a large expanse of glazing into your design will ensure your newly expanded room is flooded with light all year round. Suited to both contemporary and period homes, glass extensions are governed by building regulations, although you may not need planning permission. Find out all you need to know in our guide to adding a glass extension. Adding a single storey extension at the rear of your property can totally transform your home. It might be that it allows you to have a larger kitchen diner or living space. Or, let's say you have a kitchen running across the back of your house and you extend 2m out into the garden; you then build a partition wall at the back end of the original kitchen to create a room in (effectively) the middle of the house that's 1m to 2m deep. In that small, dark space, you can put utilities, whether a utility room or cloakroom, while your kitchen sits within the garden end of the original room plus the new extended space. You sensibly put rooflights into the roof of the small extension to make your new kitchen lighter and brighter than the new room, plus of course with the new utility space behind it, you've freed it up of all the laundry space and extra storage space you might have needed before. Use our guides to adding a single storey extension and planning a utility room to get your small house extension spot on. Looking for more extension advice? Update or replace a dated extension?